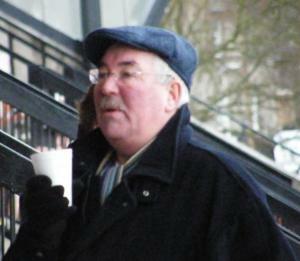 For many Eat of Scotland Football supporter you will be familiar with the name Keith Anderson, for others you have probably read his reports, previews and updates over the past twenty-four years in the Edinburgh Evening News. However, Keith has now decided to call it a day and put his pad and pencil to bed. Keith’s first involvement with East of Scotland League football was when he was nine years old and one of his friends in Selkirk said that his dad was going to take him to see Rangers. At that time Keith had just become interested in football in the rugby-orientated Borders and had watched highlights of the World Cup Final the previous year in 1958 when Brazil beat Sweden in the final courtesy of a couple of goals from Pele who was later to become his idol. Anyway, back to Rangers. On the Saturday afternoon Keith met with his friend, Michael Nichol, and his dad, Bill, and off they walked. They wandered around the outskirts of a textile mill, over a dyke and crossed the railway. Just over the railway line was Ettrick Park, home of Selkirk. Keith was pretty excited being there and about to watch the Rangers. However, it turned out that his friend and his dad had wound him up ever so slightly. Yes, it was Rangers they were about to watch but why were they playing in black and gold stripes? Yes, you’ve guessed! It was not Rangers from Glasgow – but Berwick Rangers Reserves in an East of Scotland League match. However, whatever happened was about to have a huge influence on the rest of Keith’s life. Keith was totally hooked on football from that day on, he played for a boys team called Selkirk Bluebell and they were coached by former Hibs, Airdrie and West Ham goalkeeper, Lawrie Leslie. The next step up was to play for Selkirk Wolves before playing in the Border Amateur League with Selkirk Thistle as a teenager. Selkirk did not field a team in the East of Scotland League from 1967 to 1971 so, in effect, Selkirk Thistle was the only team in Selkirk. As he worked in Edinburgh and lived in various flats across the Capital from 1966 to 1968 Keith played for Civil Service Strollers Under-21 team and almost scored on his début against Danderhall in a 3-3 draw! 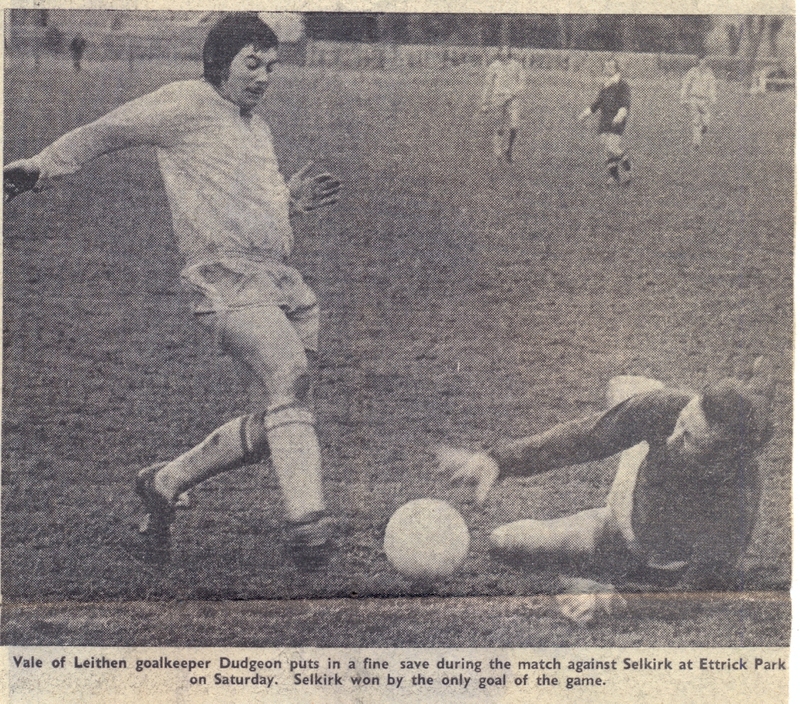 At age 21, for the 1971 / 1972 season, Selkirk decided to re-enter the East of Scotland League and their first league game was a trip to play Cowdenbeath Reserves at Central Park where Keith would make his East of Scotland League début. And some début it was! They were beaten 10 – 3 by a team which included a certain Davie Marshall who was in the twilight of his career after playing mainly with Airdrie. Keith had never before encountered such a strong and imposing player in his entire footballing career, Keith didn’t do too well and he scored four goals! That was his welcome to the East of Scotland League. Selkirk did improve and they finished that first season in thirteenth place in an eighteen-team league having won ten games. 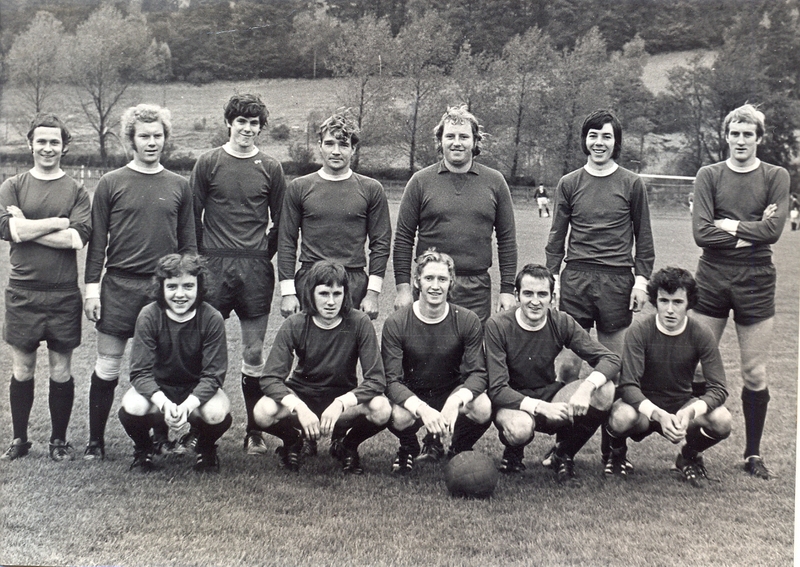 The 1973 – 1974 season was to prove to be history-changing for Selkirk Football Club when Ian Whitehead, a player with Queen’s Park, Ayr United and Berwick Rangers, took over as player / manager. He immediately changed the fortunes of the club and during his five-year reign Selkirk won all that was available to them – ten trophies in what has become known in Selkirk as “The Fabulous Five Years.” Keith was very fortunate to have played his part in the first two years and picked up winners medals as League Champions, Scottish Qualifying Cup Winners, East of Scotland Qualifying Cup Winners and King Cup Winners. A ruptured anterior cruciate ligament injury in November 1975 at Hawick was to end Keith’s East of Scotland League career. He then became trainer at Selkirk before moving with Ian Whitehead to Hawick Royal Albert as his right-hand man. His regular career as a Government Official took me up to Broughty Ferry and it was not until he was transferred back to Edinburgh in 1989 that Anderson then took an interest in reporting on East of Scotland League games. His youngest son, Kevin, was in the same class at Parsons Green Primary School as a lad named Craig Lothian who is the son of Bill Lothian, the Edinburgh Evening News’ chief rugby reporter. They chatted about all things sport and one thing led to another and Keith met with the Sports Editor. His name is Bob Angles, long since retired and he said he would give me a six-week “trial” writing about the East of Scotland League, which has extended to 24 years. Keith said “My first official game as a reporter was on 19th August 1989 when he went to Riccarton to report on Heriot-Watt University v Selkirk in a First Division match which Selkirk won 3 – 0 with a double from Paul Brownlee and another from Alan Wilson”. “As a reporter there are probably too many games to highlight although Scottish Cup ties will always be dear to me. 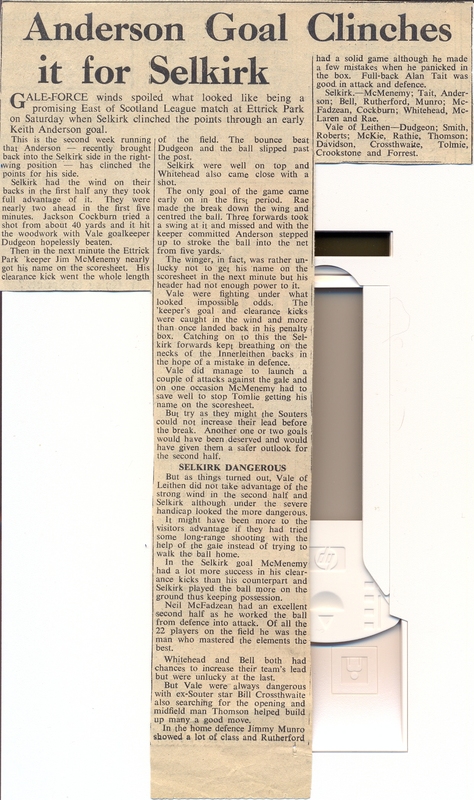 Selkirk went to Kilbowie Park in 1977 and lost only 2 – 0 to a Clydebank side that included the late Davie Cooper. Whitehill Welfare beat Fraserburgh away from home after a draw at Ferguson Park to earn a home tie against the Scottish Cup holders, Celtic, in 1995. The game was switched to Easter Road and the Whitehill team put on a great show, losing only 3 – 0. Spartans had some amazing results in the 2000’s with wins against Arbroath, Alloa Athletic and Berwick Rangers as well as drawing with St Mirren at City Park. Edinburgh City scored twice against Dunfermline Athletic when Gordon Rae was in charge of the Meadowbank-based club. Honestly, there are so many fantastic memories I would have to write a book to include them all”. “I have made so many friends during the past 24 years and I have to thank them all for their continued support when I have been telephoning them at some unreasonable hour to ask for information”. “I remember on one occasion in the early 1990s when Tam Brown of Civil Service Strollers invited me to the players’ Christmas night out at the Steam Packet off Rose Street. After an enjoyable meal and a few glass of wine we all came out into Rose Street where a busker was playing the guitar and trying to earn himself a few pounds for the festive period. Tam said that he could play the guitar. I retorted that “no way” could Tam play a musical instrument and sing! I bet him ten pounds he couldn’t! Tam promptly “borrowed” the busker’s guitar and began to serenade the people in Rose Street. Keith Anderson was ten pounds down although, to be fair, I gave it to the busker”. “Yes, this was not an easy decision to make to “retire”. However, I will not be lost to watching football at the level that I really enjoy and with the advent of a Lowland League and Hibs entering the East of Scotland League there are many changes which are going to be good for the game”. “It took me a long time to decide and I am happy with my decision but don’t think that you won’t see me around the grounds I have played on and reported from on numerous occasions”. “Finally, a really big “thank you” to everyone who has helped me over the past 24 years”. Andrew Waddell said “Keith was a tireless supporter of the website and Saturday mornings were typified by lots of calls keeping each other up to date with what was on and what was off”. Keith thank you for everything you have done for East of Scotland Football and we look forward to seeing you next season, happy retirement! Keith, all the very best on your retirement. You truly deserve all the thanks and praise written about you. The East of Scotland league will be a poorer place without you. Without you many players would probably never have made the jump to semi pro level, myself included. It was your reports and articles which caused scouts to attend games and present us with an opportunity to play at the higher level. Sincere thanks to you as it is never forgotten…..despite it being TWENTY years ago. I will let you guess who wrote this article by reminding you that you attended my 3 finalist games with Doggie Caddie and Alex McGhee……..the next Duncan Ferguson!!!! !